This room in the house is probably the most neglected…at least ours was…the bathroom! I wonder if it’s because it’s such a small room, or because it’s out of the way, but taking time to declutter and organize the bathroom will pay big dividends in the end. 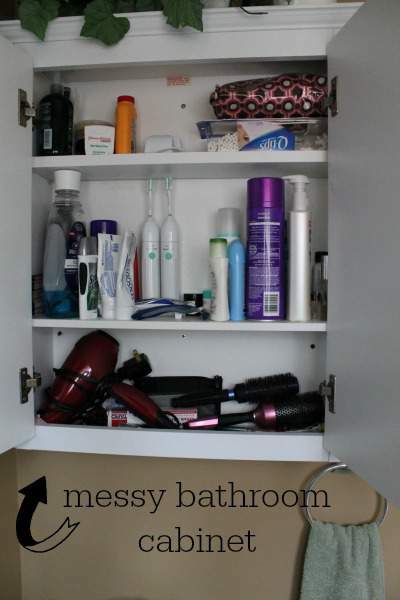 I’ve put off organizing my bathroom for many months, partly because I was so tired from having organized the rest of the house, and partly because I didn’t think it was so bad, but was I wrong! I found a lot of clutter in our tiny master bath, and it felt good to get it all purged and organized. I guess, to be fair, I should mention that they did put in a large-ish cabinet in which to store toiletries, but it isn’t big enough for two people, one of which happens to be a woman. To compensate, I added these ugly plastic drawers to the room when we moved in 5 years ago, meaning to replace them with a proper vanity with drawers when we finally saved up the money to have it done. Well, you know how things go…there was always something else that needed money, so we still haven’t put in a vanity yet. I’m hoping to get it done within the next few months–I did buy new paint, and I have picked out the vanity I want at Home Depot, now it’s just finding time to take out the old sink, paint the room and schedule the vanity to be installed. To begin, I first took everything out of the drawers and the cabinet, wiped them down well, and started tossing the things that were expired, just plain old, or that I didn’t want anymore. I had to fight that old urge to save things just because I had spent money on them…if I hadn’t used them in over 6 months (i.e., the dry shampoo that never really worked well), they went into the trash. If you have expired medication in your bathroom, as some of us store prescriptions or even our vitamins in the bathroom, you want to be careful about how you dispose of them. Do some research on your particular area about pharmacies or local government agencies that take expired medications for disposal. In my area, this is only done once a year, and since I didn’t want to hang onto old pills for half a year (and probably forget all about when the disposal day came around), I decided to get rid of them myself. The safest way to dispose of old medicine, according to my research, is to place the tablets, etc. into a plastic zipper bag and pour old coffee grounds or cat litter over top. Seal up the bag and then dispose of it in your regular trash. This is to prevent any animals accidentally eating the medicine, or letting it seep into the soil/groundwater. When we first moved into our house, we were in such a hurry to get everything unpacked and put away that I really didn’t think about systems. But after 5 years, I realized that I really needed to get a system in place that actually worked, because the one I had haphazardly set up was really annoying. For instance, in those plastic drawers, I had put things that I didn’t use very often, like nail polish or plastic soap containers for traveling. Things that I did use on a pretty regular basis were kept in the linen closet out in the hallway. So when I needed an extra razor or a tampon, it was always at the most inopportune time to leave the bathroom to trudge out into the hall. Now my drawers contain items that we actually use, and those items are organized! 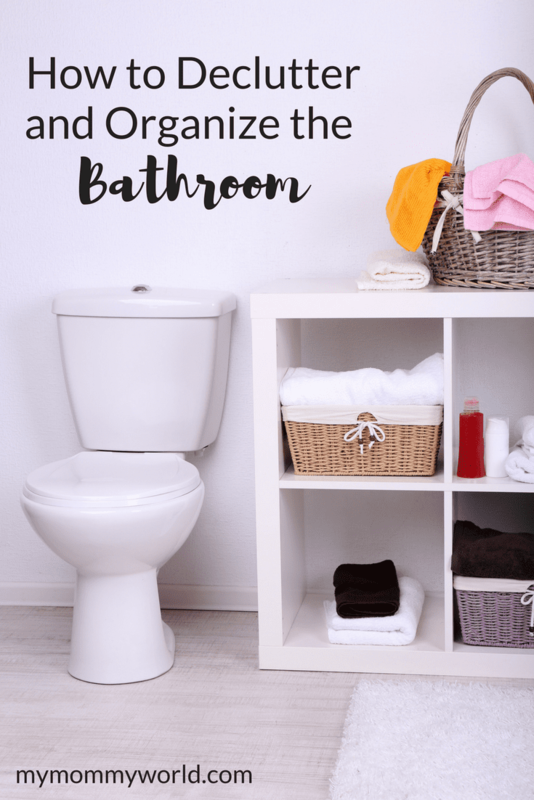 After taking the time to declutter and organize the bathroom, getting ready each day is more peaceful because there is less junk around to navigate through, and the things that I actually need are all in order (inside the bathroom). The bonus is that this whole job only took about 45 minutes, which wasn’t too bad at all! Thanks for the inspiration to organize the bathroom, Erin. 🙂 I also never knew the proper way to dispose of medicine, and I never would’ve guessed to put it into a baggie with coffee grounds. 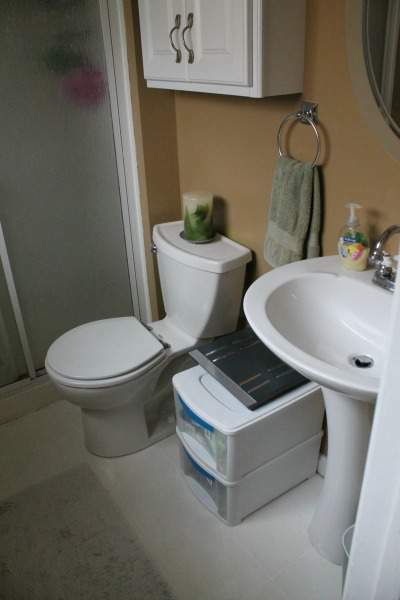 I know storage space can be hard to find in the bathroom. We have no storage at all in the bathroom downstairs. Not even a place for an extra roll of toilet paper. It has to sit in the windowsill. But I’m happy our most used bathroom has a good sized vanity. Whenever I organize our bathroom I always find medication that has expired too. In our area we have a drop off once a year like you do. I usually store it all in one cupboard where it I see it often enough to remember when the day comes around. But I have disposed of the old medicine in the used kitty litter. It works well too. Oh dear, that bathroom sounds very tiny!